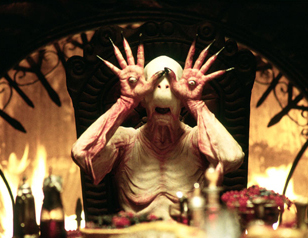 An interpretation of a parable, as director Guillermo del Toro described his film, is always open to dispute, unless the author himself clarifies the meaning he intended. Since I do not imagine such explanation will be forthcoming, I will describe how I interpreted that parable. The girl Ofelia represents Spain. She was a princess when Paganism still dominated Spain, that is, she had a vocation to rule over different peoples someday if she remained under her father, the king of the subterranean world, the Devil. But the girl fled the world of the darkness and entered Christendom. The light she saw - the Catholic Faith - “blinded” her so that she forgot her origins and promise. This mention to the Catholic Faith as a harmful light is the first insinuation of the battle between the two gods of Theosophy - the black god, who at present is defeated and in darkness; and the victorious God of light, whom we Catholics adore as the true God. According to the theosophical fable, the White God is the bad one, and vice-versa. Thus, the goal of Theosophy is for the Black God - Satan - to depose the White God. 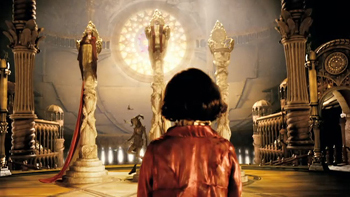 This is the background of the fight between darkness and light present in this film. After leaving the world of darkness, the princess had many “reincarnations,” that is, Spain assumed many different faces during its history. The film focuses only on the 20th century transition from Monarchy to the Franco Regime and then from this one to the new Monarchy we are witnessing today. The Spain of that time, Ofelia, had been born from the marriage of her mother, Carmen - the Catholic Church - with the monarchical regime that preceded the Civil War - her father, is presented as a tailor, a man concerned only with appearances. It is an understandable portrayal of the superficial monarchy of Alphonse XIII that preceded the Civil War, very concerned about status, titles and appearances. Soon after the death of her husband - the end of the old Monarchy - the Catholic Church married Francoism, represented by Captain Vidal. In this marriage, a son - a new regime - was conceived. During her difficult pregnancy, the Church is sick and completely dominated by Francoism, which obliges her to come to his headquarters to give birth to the infant. As Carmen travels to the headquarters of Captain Vidal, that is, as the Church aligns herself with the right, she has a crisis, and Spain, Ofelia, is attracted to the occult Paganism of her deep past. She restores the eye to a stone idol - a faun. With this help Paganism, still petrified and unable to move, finds the way to see again. From the silent, gaping mouth of that idol comes an insect, a kind of preying mantis, which later transforms itself into a devil-like “fairy” and becomes the normal means of communication between the faun - the occult Paganism - and Ofelia. So Ofelia’s mother, the Church, enters Franco’s headquarter and is treated like a paralytic, completely subservient to Francoism. She does all she can to make Spain accept Francoism as her father, but the girl refuses. In one scene between mother and daughter, at Carmen’s request, Ofelia tells her brother-to-be a fairy tale – setting out for him the new ideal of Spain. The brother is the coming Monarchy of Juan Carlos, made by Franco with the agreement of the Church. In her story, Ofelia tells her brother to enter the world of occult and look for a mysterious rose at the top of a dark mountain covered with thorns. During her stay in this Francoist headquarters, the Church is assisted only by the Leftist Bourgeoisie - the physician Dr. Ferrero - and by Socialism, represented by Mercedes, the kitchen maid. Mercedes secretly helps her brother Pedro and his guerilla companions - who represent Communism and live in the hills surrounding the Francoist headquarters. Socialism, that is, the maid Mercedes, serves Francoism, but she also assists Communism, feeding the guerillas with food from the storerooms of Francoism. 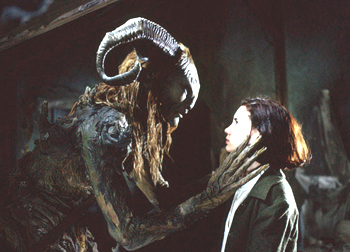 Soon after Ofelia enters the Francoist headquarters, the "fairy" appears to her and shows her the way to the labyrinth – her initiation - that will allow her to return to the subterranean world. To get there, she must retrace the steps of her conversion. Just arriving in the underworld, at the sound of her voice, a stone statue of a faun takes on life. Back to life, the faun - the occult Paganism – invites Ofelia to return to her ancient vocation of serving the king of darkness, the Devil, her true father. She accepts and is submitted to three tests that she must succeed before the labyrinth’s portal will open, that is, a new era wherein an occult Spain will reign. In the first test, the faun gives Ofelia three magic stones - three ideas – that she must place in the belly of a gigantic frog that lives in the roots of a huge dead tree, which represents society. With this, the frog will die and the tree will recover its life. Even though these three ideas are not clearly specified in the film, it seems to me they are Liberty, Equality and Fraternity. 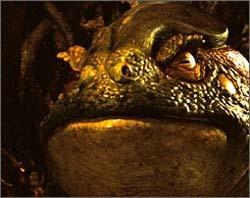 Then Ofelia is to return with a gold key she will find in the frog’s belly. Spain takes off her beautiful dress given to her by the Church and paid for with Francoist money, and creeps into the deepest roots of society. As she crawls along in the deep mud - into the social movements – and encounters ugly beetles - the poor people - she comes upon the enormous frog – Feudalism - which faces Ofelia to defend its quarters and continue feasting on the miserable bugs. Feudalism, which had killed society and prevented it from taking on new life, according to the occult saga, also tries to eat Ofelia. The girl tricks the frog, pretending to throw it a beetle, but actually giving it the three magic stones. As soon as that old Feudalism swallows them, it vomits everything it had eaten and dies. Amid its innards is the key that gives life to Feudalism – which is, I believe, the concept of private property, also central to Capitalism. Ofelia retrieves the key and brings it to the faun. The first test is accomplished. Spain killed its old Feudalism. The second test is to enter the secret halls that are in the underground of the Francoism headquarters where a terrible monster exists. The monster presides over a fabulous banquet table filled with tempting food and drink. This eyeless monster slumbers immobile at the head of the table, only awakening when someone eats something from his table. Then he starts up and consumes the naive who benefited from his offers. Although Ofelia was warned to eat nothing, she cannot resist taking a few grapes. At her first swallow, the monster awakens, and we realize that his eyes are on his hands, which he raises to his empty sockets so that he can see - in order to seize and devour her. By this we are to understand that he can only see what is palpable. What monster is this but Capitalism turned to devour everything it seizes? Before eating the two grapes, however, Ofelia had found the tabernacle of Capitalism, and with the gold key of private property, she opened it and drew out the dagger that would immolate the coming Monarchy. I cannot imagine what this dagger would be but a secret doctrine of self-destruction to finish with either Capitalism or Monarchy. It was easier for Spain to face and defeat its old Feudalism than to resist the temptations of Capitalism. Because she enjoyed some fruits of its table, she barely escapes alive. Although she retrieved the dagger, which the faun takes, he is angry with her for her self-indulgence. He tells unhappy Spain that she lost the possibility of being eternal and will never return to the underworld. At any rate, Capitalism lost its secret, and Spain learned that she should reject Capitalism. 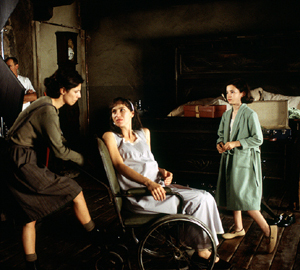 Meanwhile, the baby is born, Ofelia’s mother – the Church of the right - dies during the delivery, and Francoism loses strength. The secret support Dr. Ferrero was giving to heal the wounded Communism is discovered, and he is killed by Francoism. Captain Vidal also learns of Mercedes’ assistance to her brother Pedro; he plans to torture and kill her, but she frees herself, Socialism inflicts Francoism with some painful wounds that change its face, and then joins her brother, Communism. Ofelia is accused of complicity with Mercedes and is locked in her room. In this difficult situation, the faun appears again, to present Spain with the third test. Ofelia must bring him the newborn Monarchy to be sacrificed on the altar of the occult so that Spain can fully return to Paganism and the kingdom of darkness. But Spain protects her half-brother, the new regime, and is forced to return the infant to the hands of a wounded and drugged Francoism, who has pursued Ofelia into the labyrinth. Francoism, which always had an attraction to Socialism (Mercedes), realizing that his death is near, gives the infant, its new monarchy, to Mercedes to raise it. Socialism takes the baby - a clear reference to the present day situation where Juan Carlos does whatever Socialism instructs him. After he hands over the baby, Francoism is shot and killed by Communism. This victory of Communism, not complete yet, is what the movie is trying to favor in order to revenge its defeat in the Civil War. After refusing to hand the baby over to the faun to be sacrificed, Ofelia herself is shot and killed by Francoism. The death of this “true” Spain, however, is accepted as a expiatory homage by the Devil. There will be a new “reincarnation” of Spain in her infant brother as long as he is well raised by Socialism and follows the same occult path returning to Paganism.